We are getting ready to make our trek back north of Cape Hattaras for hurricane season. The plan is to start the trek this weekend. Our first stop will be Hilton Head, SC. where we will spend a few days playing tourist. From there we haven't decided where to go (if you have any suggestions, please feel free to comment, I figure we need a couple more stops). 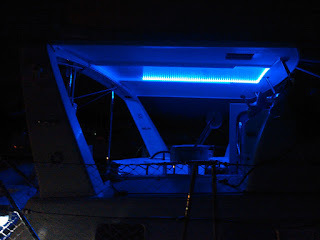 As we prepare to go, I've been doing some work on the boat in hopes that it will make the boat happy and keep the gods of the seas, electricity, and diesel engines at bay. These are finally items that aren't high priority, but nice to tick off of the list. 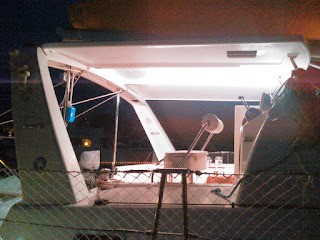 The first was re-rigging the davit system. 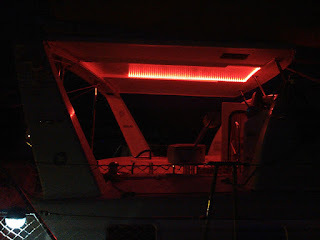 When I met another Leopard owner a while back he noted that the davit system on my boat wasn't rigged properly. The result of this rigging problem was that loads weren't distributed evenly and the davit bar bent a bit when the previous owner used to store the dinghy with the motor attached on the davit. To re-rig it, I needed a new block with a becket and a longer line (the new rigging scheme requires the lines to criss-cross between the mount points on the arch and the davit bar. A stop at Sailors Exchange and I was able to find 70 foot of the 1/2 inch line for $40. I also picked up brand new line to replace the main halyard since their price is about half of West Marine's price for the same line and a bit cheaper than I have found elsewhere for New England Ropes stuff. I also found they had the really comfortable bosun's chair like the one I borrowed from a friend back in Brunswick and I couldn't pass it up. Guess you can't take me into a sailing thrift shop. Unfortunately they didn't have the block with becket or a stainless U bolt I was looking for, so we picked them up at Marine Supply & Oil Company. New block and line and the davit is re-rigged. The actual re-rigging of the davit was pretty easy. I lowered the davit and removed the line. I then moved the existing block at the arch to the position opposite of where it was. The new block with the becket was added where the old block was removed. The new line was then tied around the becket, led down to the davit block, diagonally across to the other arch block, back down to the other davit block, diagonally across to the new block and through the remaining blocks to the winch. 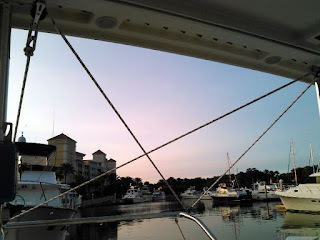 This configuration does seem to allow the bar to self-level better and I believe it also gives me almost double the purchase...and that makes the dinghy easier to crank up on the davit. The U bolt I mentioned was for a minor repair. In the rudder system there is a line that acts as the steering stop. On one side, the U bolt had rusted through and the line was no longer attached. I've replaced the U bolt and reattached the line so the steering stop is once again working as designed. I have been trying to figure out a good means of mounting the LED light strips I bought for the hardtop for a while now. Not coming up with any really good ideas, I finally gave up and decided to see what would happen if I just stuck them up with the supplied adhesive. The strip is supposed to be weatherproof and the controller is hidden in the wiring chase that is built into the hardtop, so hopefully it will be OK. I guess only time will tell, but so far I like it and think it looks good enough. And for under $30, if it doesn't work out, I guess I won't be out much. So, various systems on the boat got some attention. Hopefully this will build up some good karma points for me with the boat. Two things - first of all, West Marine runs a 40% off line sale one day only twice a year. They just had it so it'll be a few months till the next one. Every time they run it we buy one piece of running rigging. On the light mount thing, a friend of ours glued teak trim strips up that he had routed out a channel in for the lights, similar to the way we mounted ours in our salon. Seems to protect them that way. If you didn't want teak you could maybe use Starboard. Glad to see you're making progress. If you're going as far north as the Chesapeake, try to get to the Maritime Museum on Kent Island. We really loved Kent Narrows. Piney Haven Yacht Center was a very nice marina with excellent bike paths, good service on site. Sailors Exchange in St. Augustine usually has decent line cheap. When I was there they had New England Ropes Sta Set, Sta Set X, and V-100, and even fancier stuff and their normal price is about 50% of what West sells it for. So I've tended to pick up a rigging line or two when I'm in the area. I didn't want to go with anything too fancy for the lights. Milling a piece of starboard might have worked...if I had the tools to mill it. The catch I had was trying to make a 90 degree bend and coudn't find anything that would work better than just sticking the stuff on. It seems to work fine so far. If it doesn't hold up we may have to take more drastic measures...but for now I think we are happy enough with the simple solution. We will check into Kent island. We are heading that far north again...still want to actually see the area (other than a boatyard). Would like to catch up with some friends up there and play the tourist for a while. Hope all is going well with your projects and TJ's summer job! And hope to catch up with you again sometime...maybe next fall?